Astigmatism is a common eye condition marked by an irregular curvature of the cornea. This type of condition is also known as a refractive error, and occurs in nearly everyone to some degree. If the cornea is significantly curved, the condition must be treated. 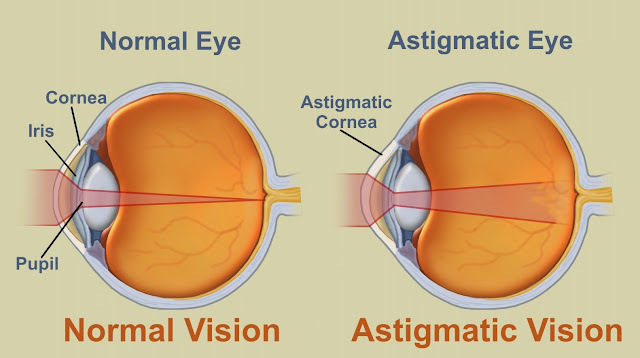 Astigmatism is usually present at birth but it can result from an injury, scar or operation to the eye, if the corneal surface is damaged. It can also come about as a result of anything pressing persistently on the surface of the cornea such as a large lump on the eyelid. Astigmatism can run in families and seems to be more common in premature or low birth weight babies, perhaps because the cornea does not have enough time to develop properly. Finally, problems with the structure of the cornea can cause astigmatism. Some of these are present from birth. About 1 in 5 people with Down's syndrome have a significant astigmatism. Other corneal disorders develop throughout life. The most common of these is a condition called keratoconus. This can cause significant astigmatism, as well as short sight (myopia), and corneal scarring. For most people, this is a very mild, minor problem which may not even be noticed. However, with more advanced astigmatism, there can be a variety of symptoms including blurred vision, light sensitivity (photophobia), eye strain and fatigue (especially after long periods of concentration, such as when using a computer), and headaches. You may have difficulty seeing one colour against another (contrast) or you may experience distorted images, such as lines which lean to one side. 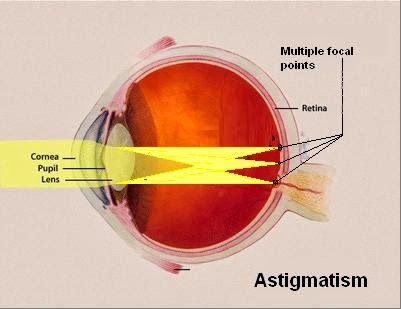 Severe astigmatism can cause double vision. Astigmatism usually occurs with either short sight (myopia), long sight (hypermetropia) or age-related long sight (presbyopia). The goal of treating astigmatism is to address the uneven curvature that's causing your blurred vision. Treatments include wearing corrective lenses and undergoing refractive surgery. Contact lenses. Like eyeglasses, contact lenses can correct astigmatism. A wide variety of contact lenses are available — hard, soft, extended wear, disposable, rigid gas permeable and bifocal. Ask your eye doctor about the pros and cons of each and which contact lenses might be best for you. Contact lenses are also used in a procedure called orthokeratology, or Ortho-K. In orthokeratology, you wear rigid contact lenses for several hours a day until the curvature of your eye improves. Then, you wear the lenses less frequently to maintain the new shape. If you discontinue this treatment, your eyes return to their former shape. Wearing contact lenses for extended periods of time increases the risk of infection in the eye. LASIK surgery. Laser-assisted in-situ keratomileusis (LASIK) is a procedure in which a doctor uses an instrument called a keratome to make a thin, circular hinged cut into your cornea. Alternatively, this same cut can be made with a special cutting laser. The surgeon lifts the flap and then uses an excimer laser to sculpt the shape of the cornea under the flap. An excimer laser differs from other lasers in that it doesn't produce heat. Laser-assisted subepithelial keratomileusis (LASEK). In this procedure, a much thinner layer of cornea is folded back, which makes your eye less vulnerable to damage should an injury occur. LASEK may be a better option if you have a thin cornea or if you're at high risk of an eye injury at work or from playing sports. There are no known preventative measures that will reduce your chances of getting astigmatism. However, routinely getting a comprehensive vision exam will reduce your chances of astigmatism going undetected (unidentified) and untreated. People at high risk of sight problems need more frequent eyesight checks. If you have diabetes, raised pressure in your eye (glaucoma), macular degeneration, or a family history of these conditions, you should check to see what your optician recommends about regular check-ups. As a guide, if you fall into the high-risk group, you should have at least a yearly (annual) eye examination if you are over 60 years of age. If you are over 50 years of age it should be every two years, and over 40 years, with risk factors, then an eyesight check is recommended at least every three years. Low-risk people with no symptoms of an eyesight problem, do not need to have their eyes tested so frequently. If you fall in this group and are aged between 19 and 40, an eye test is needed every ten years. Between the ages of 41 and 55, it is recommended that you see an optician five-yearly. At any age between 56 and 65, two-yearly checks are needed, dropping to annual checks in low-risk people who are 65 or more.